In the fall of 2012, I spent a semester at the University of Dar es Salaam, in Tanzania, studying African international relations and Swahili culture. Chuo kikuu, as the university is commonly described, sits on a hilly tree-lined campus in the northern part of the city. After classes most evenings, my friends and I would watch the sunset from the roof of Hall IV, our dormitory. From that vantage point you could easily spot gangs of stray cats and troops of monkeys, the two groups of pests that inundated the campus landscape, but we were also able to see as far as the harbor in the southern part of the city. While counting the ships waiting to dock at the port of Dar es Salaam, we often mapped out our adventures through the city and its surrounding beaches on this canvas. For nightlife, we rotated between Oyster Bay, Msasani and the clubs in the CBD around Posta. Many a Friday we also ventured to Kipepeo – my friends Terry’s and Pat’s favorite beach – which was just across the harbor, to take advantage of free entry on weekdays. Kipepeo translates to “butterfly” in English. Like the hatching of a chrysalis, I often wished we could sprout wings, take off from the roof of Hall IV and be at Kipepeo before the next ship docked. This is because traffic in Dar, much like Lagos where I grew up, is terrible. The average commute along one of the main transit corridors, the 16km (~10 miles) Bagamoyo-Ali Hassan Mwinyi arterial road lasts between an hour to two hours. This can increase by an hour or more during rush hour and does not include time spent waiting for public transport. Traffic on Morogoro Road. Photo Credit: Flickr/Stefano C. Manservisi. Although it was possible to avoid most of the midday traffic by leaving chuo around 11am to beat the Jum’ah rush, the journey still always took about 2-3 hours: first we caught a daladala (minibus) from chuo to Mwenge terminus, switched to another from Mwenge to Kigamboni ferry terminal, then hopped on the ferry and finally hired a bajaji (auto rickshaw) to get us to the beach itself. The first couple of times, I remained oblivious to the different routes the daladalas used to access the city center and the ferry terminal. Eventually, I realized that sometimes the daladala used the Bagamoyo-Ali Hassan Mwinyi route and other times, we passed through Morogoro Road. More importantly, I also noticed something our rooftop mapping and time-consuming commutes only hinted at: Dar es Salaam has too many cars and too few roads. With increased rural-urban migration, the population of the Dar es Salaam metropolitan region is predicted to grow by 85% between 2010 and 2025. Both slums and satellite cities are emerging to accommodate its most recent arrivals. However, because employment and market opportunities are largely concentrated in the city center and around Kariakoo market and the harbor, demand is especially especially high on public transportation. According to a study on mobility and modal choice in East Africa, 43% of all vehicular trips in Dar es Salaam occur on daladalas, bajajis, taxis and motorbikes. Because commuting by daladala is the cheapest and often most accessible mode of public transit, up to 60% of public transit trips are made on daladalas. 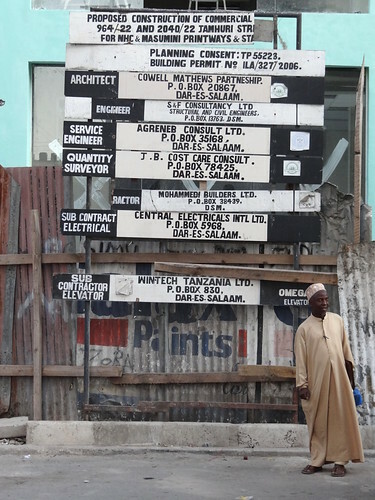 Construction signage in Dar es Salaam. Photo Credit: Flickr/ Adam Jones. Commuters can take three or four daladalas per day experiencing the relative inconvenience of this form of transportation. So commuters who can afford cars, do so, in order to avoid the unreliability, discomfort and unreasonably long travel times associated with public transit. 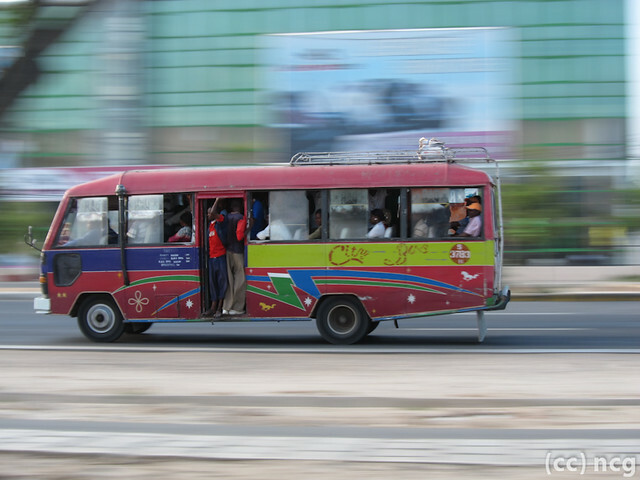 More than 120,000 private vehicles ply Dar’s roads everyday carrying only 6% of its residents. Apart from the spatial growth of the city, the layout and road capacity of Dar also affects mobility. All arterial roads originate from the city center and the result is that peak hour traffic is one-directional: towards the city center in the mornings and away from it in the evenings. Overall, roads only cover 2.5% of the city compared to 15-20% recommended by national town planning space standards. This means that road expansion cannot keep up with the demand for use by both public and private vehicles. Even more, congestion is exacerbated by the constant lane expansion projects on the arterial roads and the construction of new overpasses and underpasses at major intersections. After my first month in Dar, I began to use the billboards announcing the road improvement projects as landmarks to guide my urban explorations. In a bid to decongest the city center and reduce travel times, the Dar es Salaam City Council and other government agencies conceived the Dar Rapid Transit (DART) system in 2003. Consisting of 130km of BRT corridors, the DART network is scheduled to open this year. The first phase of center-aligned BRT lanes and stations on Morogoro Road is over 70% complete. The BRT is slightly controversial because it will divert existing daladalas to serve as feeder services to DART, gradually rerouting them until the entire network is completed. Furthermore, due to expropriation of land for stations and terminals, the project has also been challenged on governance issues; there is no clear policy identifying who should pay compensation to city residents whose property will be demolished. In the context of the city’s rapid geographic and population expansion, Dar’s BRT network could fill the gap between public transport demand and service provision and tackle its congestion problem. Nevertheless, there are several equity issues that need to be resolved. First, there needs to be proper compensation for all owners of displaced businesses and property. Next, prices need to be made affordable. According to the CEO of DART, Asteria Mlambo, the BRT fares will be more expensive than daladala fares even though in a recent survey, only 2% of public transit commuters considered current fares to be affordable. Ultimately, increases in road capacity and improvements in the delivery of public transport services will only be able to reduce congestion and catalyze growth if they are integrated with proper physical planning strategies. Thus, it is very important that the new masterplan includes strategies like the development of satellite towns to decongest the city center and bring services and infrastructure out of the urban core. I look forward to visiting Dar again soon and using the DART network to get around. Post by Kasope Alesh. He can be reached on twitter @ohkasope. I have once heard it say that when all commuters and inhabitants in New York City’s skyscraper districts wanted to go out on the road all at the same time, pedestrians would have to pile three layers high to do so. While I don’t know if it is entirely true it points to a problem that probably cannot be solved after a larger agglomeration has begun to build from a more humble beginning: to accommodate the higher demands on transport frequency and passenger amounts that go with increased economic activity and shopping, maintenance, deliveries etc., the “arteries”, i.e. roads would later have to be broadened after the buildings have already been put into place. Since this is impossible (if you don’t want to tear everything down like Ceaucescu had planned for Romania before his timely fall as a dictator), the only possibility would be to later put a tunnel infrastructure UNDERNEATH such a city with subway tubes that could provide the necessary capacity by opening up another dimension, literally. Such has happened in New York, in Berlin, in London, Moscow and Paris. I believe this would actually pay for itself, if a sensible levy was raised: imagine if everyone could cut out one hour per day for a two hour commute or two hours for a turnaround? Even at African wage levels that would probably be a no-brainer?! This is an excellent piece. I do hope public transit includes non-motorized transport,that is improving walkability and also cycling infrastructure (which might include tree shade given the heat). Jackie, you’re right, tree shade would be especially important to encourage commuters to walk for some part of their daily journeys. Fortunately, the original DART proposal includes plans for safe sidewalks, pedestrian crossings and bicycle lanes parallel to the BRT corridor. Maureen, I don’t know much about subways but I can hazard a guess that construction costs are at an order of magnitude greater than BRT or other similar overground transit solutions. Furthermore, the time horizon for planning and constructing tunnel infrastructure is infinitely greater. While you are absolutely correct about space constraints brought about by poor planning/rapid development, I am not sure that subways represent a viable solution for Dar es Salaam or other rapidly urbanizing African cities at this time. Although it is an outlier, the long-awaited 2nd Avenue subway immediately comes to mind as n example of the complicated nature of subway construction – it has been estimated to cost $2.23 billion per mile and subject to significant political obstacles and construction delays. For further reading, CityLab has a useful analysis of the project’s affordability: http://www.citylab.com/commute/2014/07/nyc-cant-afford-to-build-the-second-avenue-subway-and-it-cant-afford-not-to/374538/. For cities that do not have any subways or experience with underground transit solutions, it would be difficult to set up these systems from scratch. As I reported, the establishment of satellite towns has the potential to ease the displacement of economic activity caused by the transit improvement projects by shifting services and infrastructure away from city centers.